Are you a hotel owner drowning in excessive resurfacing costs for your swimming pool? If you own an outdoor in-ground pool you likely know the effects our extreme Canadian climate, particularly the freeze/thaw cycle, has on outdoor pool surfaces. Indoor pools fare no better as they have to be subjected to huge amounts of harsh chemicals to keep the water clean and safe for hotel guests. Overtime, pool surfaces breakdown; traditional pool paint and plaster simply cannot stand up to the wear and tear and must be renovated. These repairs can be a costly expense and, more often than not, swim downtime turns from weeks to months. This is why so many hotel owners face the reality of pool refinishing on a frequent and continuing basis. Various options are available for failed pool surface renovations ranging from numerous types of pool paint, plaster (marcite) and vinyl liners to fiberglass and aggregates just to name a few. In the good old days swimming pools used to be coated with a brilliant white rubber-based paint. This type of paint was known for its durability against stains, imperfections and it had a bright white appearance. During the late 1980s, Government regulations banned many of the key ingredients that made these paints low maintenance and they were no longer free from imperfections. 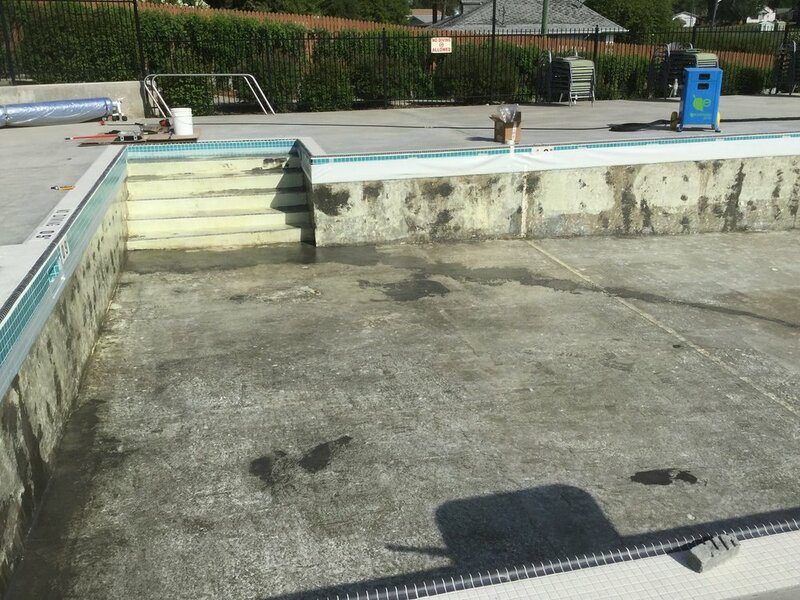 Blistering, chipping, peeling and fading started appearing on the pool surfaces in as little as six months; this forced an industry wide swing to plaster finishes. While plaster is beautiful, it has its own issues - it requires a long and complicated start up process and is prone to staining, mottling, popping off, shrinking and cracking. When plaster (a mix of Portland cement and sand) is applied to a swimming pool shell, it requires at least two to four weeks of ‘cure time’. After the pool is filled with water, another phenomenon known as calcium leaching occurs and, harsh chemicals are required to balance the pH levels. Once again, there is an additional wait time to normalize the water and use the pool. For the hotel owners with outdoor pools - renovations and resurfacing drastically reduces the outdoor swim time in an already short pool season. The above industry plaster report was published over two decades ago - many commercial and residential pool owners are still dealing with failed pool finishes! Thankfully, technology advances at a much quicker rate these days and more options are becoming available. One innovative technology was specifically adapted from the powder coating industry in 2008. ecoFinishTM has changed the entire pool industry by utilizing a thermal spray system that incorporates the use of modified acrylic resins specially designed to obtain a smooth thermal sprayed finish. Finally, there is such a thing as a worry free finish that uses less chemicals to maintain, is hard wearing and eco-friendly. The easiest way to describe ecoFinishTM thermal spray coatings or finishes is to say it’s like painting a blank canvas with a fire brush. Thermal spray systems produce soft-to-the-touch finishes that are multiphase, bond easily and flow wet to form smooth and continuous instant cured coatings or ‘barriers’. These ‘barriers’ become a non-porous permanent pool liners. ecoFinishTM thermoplastic finishes are applied pneumatically- air and propane are all that is required to operate the completely mobile spray system designed to be operated by a two person team. The thermoplastic barrier or finish begins as millions of multi-coloured beads of powder which are propelled through a patented applicator ‘gun’. These tiny plastic beads are melted out as they pass through the gun and become liquefied. When they hit the substrate, they solidify and become chemically bonded with the surface. Thermoplastic coatings cure instantly; hotel client downtime for swimming is significantly reduced because the pool can be repaired and finished and, when the final coat is applied the pool or spa owner is able to be fill it immediately. Depending on the amount of renovations prior to the thermoplastic application, typical swimming pools can be completed in less than one week. Look for this sign of excellence. 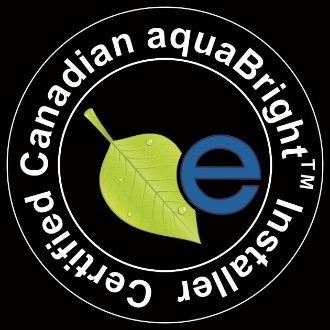 certified Canadian aquabright installer button. ecoFinishTM swimming pool finishes are designed for concrete, plaster, steel, aluminum, fiberglass and/or hybrid pools and spas having a combination of different surfaces; thermoplastic finishes enable colour continuity throughout. ecoFinishTM developed their signature pool finishes, known as aquaBrightTM and polyFIBROTM as a solution to the issues associated with paint and plaster. These finishes are VOC free (no volatile organic compounds) and contain zero solvents. Thermoplastic finishes typically have a high impact and abrasion resistance and will withstand the extreme weather contrast. this fiberglass pool was old and tired and was transformed with aquabright. 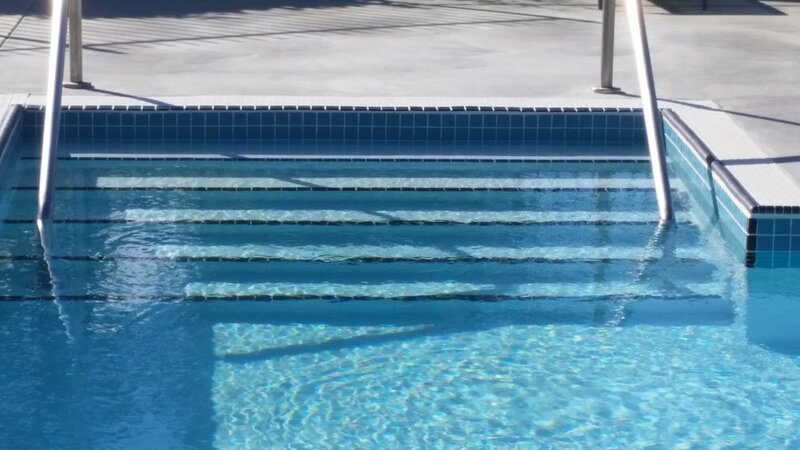 Installations on New Build Finishes: Thermoplastic coatings can be applied to new build cured concrete surfaces; fiberglass pools and spas can also be custom colored with a thermoplastic finish coat. Steel panel pools constructed to accept vinyl liners are also good candidates for thermoplastic coatings and eliminates the expense of replacement vinyl liners. 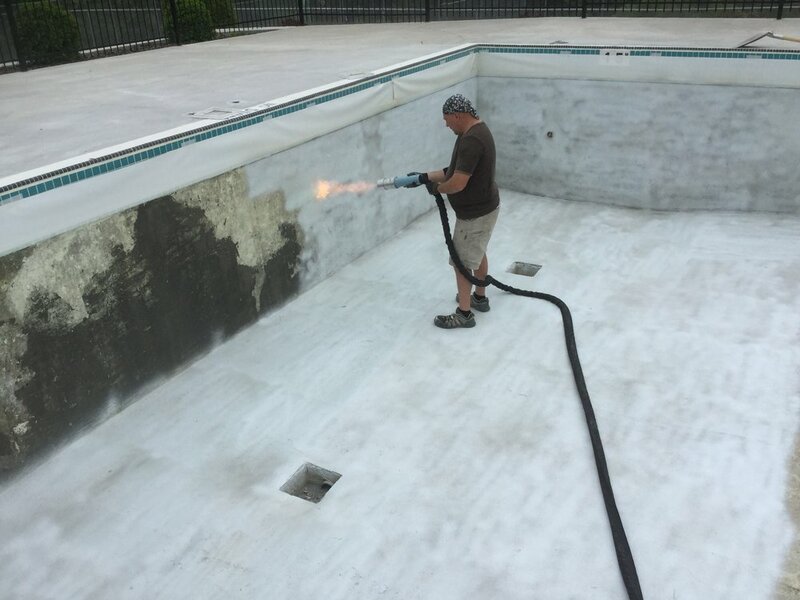 Resurfacing: Thermoplastic coatings are the solution for refinishing older existing indoor/outdoor pools and spa constructed with concrete that are painted and pools or spas with plaster (marcite) finishes that have deteriorated surfaces. Fiberglass pools and spas that are faded or tired looking can be refinished completely and in-place, eliminating the cost of removal and/or replacement and time down. ecoFinishTM high performance pool finishes capture the strength, durability and maintenance ease of old school finishes while maintaining the beauty and architectural color range of aggregate finishes. Customized logos and brand name stencils and depth markers are also available. These are applied after the final finish is applied; they are typically a contrasting colour(s), melted into the top coat and become a permanent bonded surface to the existing finish. ecoFinishTM finishes are utilized by professional pool companies internationally and, with resounding success. Canada Pool Coating is proud to be the Canadian Distributor for ecoFinishTM systems and signature pool finishes.